Read the comic? Saw the the movie? Ready to buy some awesome, one-of-a-kind merchandise to show your loyalty? Well, obviously someone knows what you like. 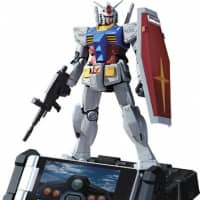 Today Softbank revealed a Gundam-themed cell phone. The 945SH G Ver.GP30th comes complete with a super-cool charger stand on which stands a iconic RX-78-2 Gundam figure. Even more exciting, while it charges, a special movie will be shown on the phone’s screen. Each one can be individually decorated by the user with Gundam stickers so that no two are the same. Makes you go all tingly, doesn’t it? 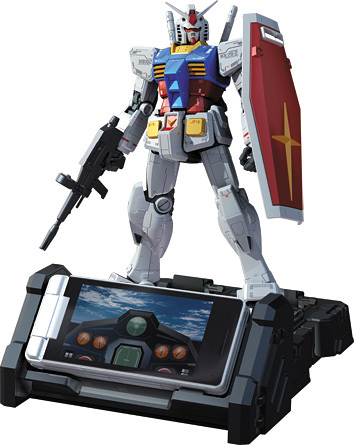 The Gundam phone is waterproof, has a touch-panel display and other features include GPS and WiFi. While the phone won’t available till mid-December, Softbank will start taking pre-orders from tomorrow at their online shop. Also on pre-sale are these funky One Piece sneakers. Of the four available designs, three come in a checkered pattern with skull motif, and the the fourth displays a print of the One Piece comic strip. Designed by Baroque Works, the sole is embossed with the One Piece logo, so budding Pirates can leave their mark when exploring uncharted lands. They cost ¥6,825 and pre-sales close on June 21; unfortunately, you won’t actually be able to put them on until after Aug. 1, when they’re scheduled to ship. To celebrate the launch of Takashi Miike’s “Zebraman 2: Zebraman Strikes Back,” Arinco are serving up a Zebraman-themed Swiss roll cake named after Zebraman’s catchphrase: “Shiro Kuro Tsukeruze Roll” (Let’s turn on the black-and-white Swiss roll). The black stripes are achieved by rolling in cocoa to the white sponge. Those buying the cake will receive a free Zebraman tote bag along with their cake. Costing ¥2,100, the cake will be on sale at Patisserie de Paradis until May 31.